Eric Trump gets a kiss from dad, presidential candidate Donald Trump, during a campaign rally at Briar Woods High School on Aug. 2, 2016, in Ashburn, Va. Currently, Democratic nominee Hillary Clinton holds a small lead over Trump in Florida, according to the newest Mason-Dixon Research and Associates poll. And Trump was in Tampa this past week (Aug. 23) trying to reach out to minority groups. His son Eric Trump spoke with us about his father and the different positions he holds on different topics. 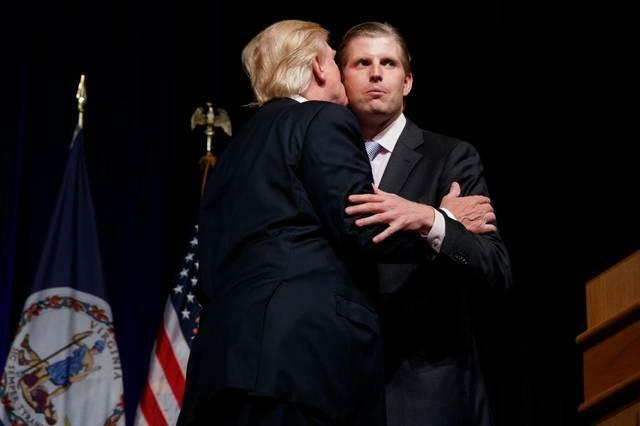 WLRN's Luis Hernandez recently spoke with Eric Trump about numerous topics including: Zika, Cuba, sea-level rise and the possibility of losing in November. 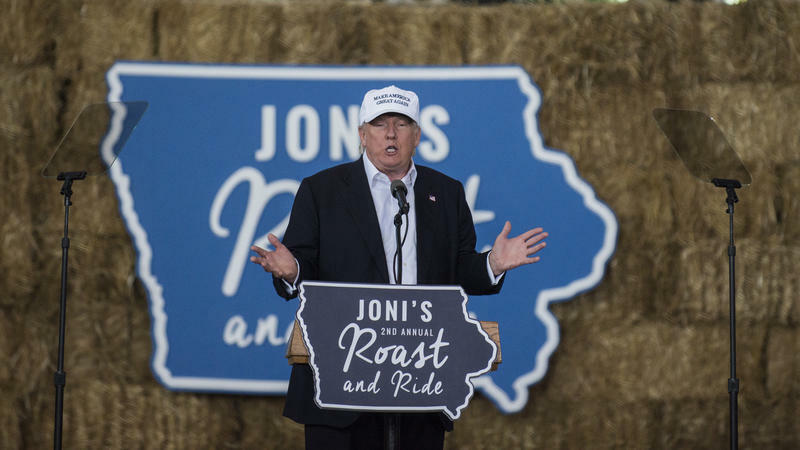 Donald Trump recently said on Fox News when talking about immigration, 'The first thing we're going to do when I win is we're going to get rid of all the bad ones.' He did go on to say, 'What people don't know is that Obama got tremendous numbers of people out of the country, Bush the same thing. I'm going to do the same thing.' Help us understand what was he trying to say there? My father's message is America first. And right now in this country we have 100 million people out of the workforce. Median income hasn't risen in this country in 15 years and there have been real problems with certain sanctuary cities. I was going around the country and I've met the families of people killed by illegal immigrants, whether it be Jamiel Shaw [a Los Angeles high school football star who was murdered in 2008 by a gang member who was in the country illegally]; there's so many of them. I think what my father was saying there is there are repeat offenders and there are bad people and there are people who violated the law and they're illegal immigrants. And those people should not be allowed to continue to exist in the United States. And again, he wants to keep this country safe. He wants to keep this country prosperous. He wants all Americans to have jobs and to have a great economy and to have median income rise, not fall over a person's lifetime. And those are things that you're seeing as a result of tremendous illegal immigration. My father is a guy who believes in immigration. My mom's an immigrant. His current wife is an immigrant. His message is simple: Just come in legally, follow the law. You know who's coming into our nation so we can ensure security. But it has to be done legally, not illegally. 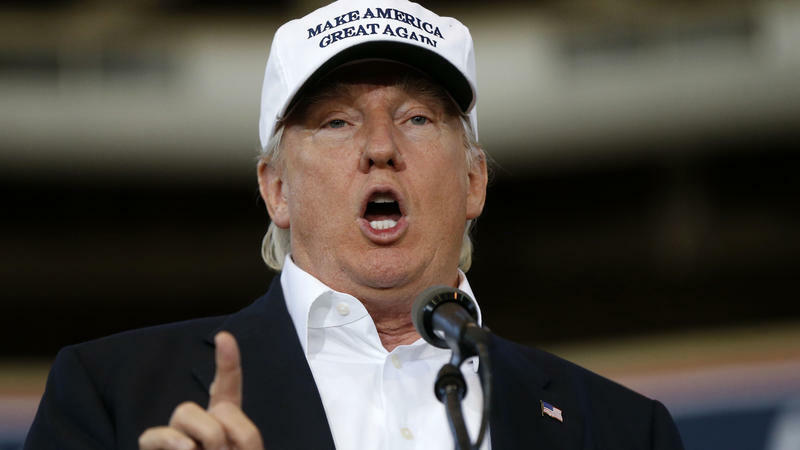 Donald Trump at a campaign stop in Jupiter. One group of people you'll see a lot of here in South Florida are Dreamers, and you're talking about young folks, people under 18 who came in undocumented. The president's tried to pass Deferred Action for Childhood Arrivals, DACA, but Congress has fought the courts have pushed back. How would President Trump treat Dreamers? I think Dreamers are what made this nation. But again there has to be a legal process in order to do that, in order to come in. And so know my father should be spending a lot of time talking about exactly this because it's difficult. It is truly a difficult subject. I mean it's people's lives and a policy will have to be formed. That policy will have to be formed and you know he's working on that? He's speaking to a lot of people and just this week he met with that tremendous amount of Hispanic leaders and Latinos and now he's hearing a lot of great feedback. And he's going to be giving major speeches on exactly this topic. Make no mistake about it, it's a topic that affects a lot of people around this country and we'll have to figure that out. And it's going to be something that he's going spend a lot time talking about. Zika is a big story here in South Florida. Does your father support the $1.9 billion Zika funding request made by the White House in February? I haven't spoke to my father about this specifically but I know it affects my life. My wife and I got married two years ago and we're entering that critical stage of our life where we're starting to think about having kids. And it's very, very scary what's happening and I think initially people probably underestimated how bad it was going to be. They relegated it to Brazil and they relegated it to so much of Central and South America and maybe even the Caribbean and now you're seeing the cases come into south Florida. This is something that's here to stay. So we better find out a problem or we have to find a solution to the problem. In fact I think just yesterday I read there was the first case of a child born with the of virus here in the U.S. and it's horrible, you look at these pictures of these beautiful children that are born with deformities because of something that's truly horrendous. And we have to do something about the pandemic. We have to stop it because it's really negatively affecting people's lives. We have properties in Florida and I know this is something that a lot of our employees and a lot of our great members and guests are concerned about and we very much need to do something about the problem. Gov. Rick Scott's been really critical of Congress on trying to pass Zika funding. 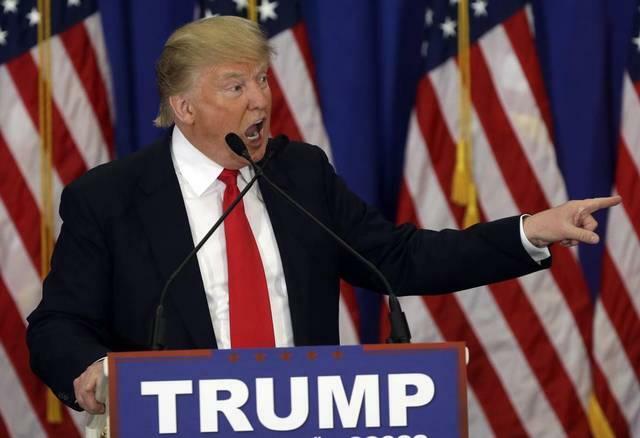 If he can't even get his own party to move on this, what will a Trump presidency do? How would your father respond to Congress on trying to get something done? I know he would do something because it's just a real epidemic and it's a real pandemic. It's a real problem for these communities. And when something like this happens we have to take care of it no different than when you have a natural disaster down in Louisiana, the government has to step in and it has to help solve the problem. We are a great western society and we can't allow an awful disease like that to affect the childbearing years of many great families or you know females who want to start great families and we have to do something about it. What does your father feel about the current relationship the U.S. has tried to create with Cuba? I think he's sitting back and watching. It's interesting. I see it personally from a business standpoint. You're seeing an opening of Cuba unlike anything that we've ever seen before. You're seeing major international companies go into Cuba, Starwood for instance, Starwood Hotels. They just went into Cuba in a very big way. Obviously it was unprecedented to see the president go down there for the first time and it's difficult. I have a lot of friends whose families were affected by what happened in Cuba. They lost land, they lost property, they lost a lot of other things. I also understand that sometimes time heals and changes are obviously made. And you know it's been progressive and a lot more people are going back there and it doesn't seem like there's a day where you can't open the paper where you don't see some celebrity walking the streets of Havana. But you just said that your father is watching it. If he gets into the White House, does he want to continue that relationship or does he want to reverse anything that President Obama's done? I'm not a politician and I'm not a guy who speaks on foreign policy. I build hotels for a living. I'm a civilian in this process. What I do is I speak about my father. I'm just saying that I personally find it very interesting because I feel that I spend a tremendous amount of time in South Florida, in Doral and other places, and I see that struggle between people who came over here and they had to come over the United States to escape what was happening in Cuba. And obviously what's been happening over the last six months with the president landing in Havana. I don't really speak to international relations. I’m quite frankly not qualified to. I just I find it to be very interesting. How about as a businessman and being in the hotel business? Cuba could be a very attractive possibility but at the same time you're talking about dealing with a regime that's we've had issues with for decades, so as a businessman how would you view Cuba? Well we’ve fortunately chosen to stay out of Cuba. We've been approached by many people and as I mentioned before you have major hotel companies like Starwood and Marriott and so many other people that are going into Cuba. But we haven't been able to get comfortable with it yet. And you know we aren't willing to do that. I think more time needs to go by and we need to see what's going to ultimately happen. But it is a regime and it's very tough. It's a different rule of law. It's a different way of life. Alejandro Herrera , a seventh-grader at Nautilus Middle School in Miami Beach, waits for the school bus in front of his condo on Indian Creek Drive during high tide on Miami Beach. 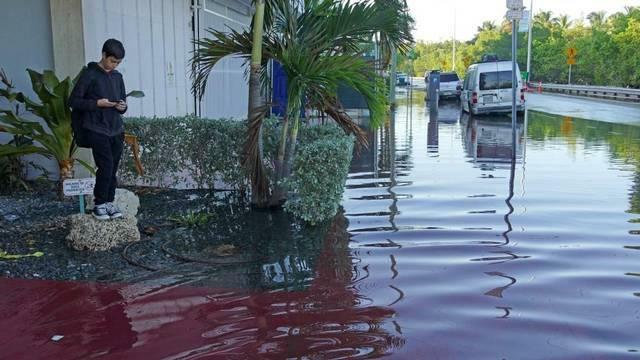 This is a big topic down here in South Florida…over the last 90 years scientific data has shown that the sea level of Miami Beach has gone up and we've seen a lot of flooding issues. That's huge considering that's a big part of our economy down here; the tourism, the beaches. How would a President Trump address this risk the sea level issue in South Florida? We have a lot of ocean front property. We have a lot of buildings in Miami and we have a lot of buildings. We have a lot of property all over all over south Florida. As a company we've got tremendous environmental awards. Many of our buildings employ so many of the green principles. But my father's also against so many of the regulations that are put in place that are such a burden on business that you can no longer conduct business in this country and then what happens is that drives businesses to China and to Mexico and to so many other countries around the world. And we lose our manufacturing in this country so I think there is a delicate balance between the two. I think you see an EPA that's become very radicalized in this country, which almost makes it impossible for businesses to thrive and succeed. At the same time I think there's a lot of really commonsense things that we can put in place because it's quite frankly the right thing to do. What would that balance look like? How do you create an environment where business can thrive but at the same time protect that environment? Well I think it's called common sense regulation that's not so overburdened. We have to allow businesses to open up in this country. Right now more businesses in America are shutting than opening which is a very scary proposition. So we have to reel back in a regulation at the same time if you look at some of the environmental atrocities of other countries, they are staggering. And that has to be fixed as well. I mean we can't put all these measures into place in the United States only to have serial abusers of the environment create such atrocities overseas that it neglects anything that we did in the United States, so I think I think we need to lead by example. I think we need to do prudent things. But at the same time we shouldn't affect business by having rampant regulations that are so burdensome that businesses can't even open in the country. So that's really the delicate balance that we need to figure out. And quite frankly we should put pressure on the rest of the world because they're contributing much more to the carbon footprint then countries like America that really have put in smart regulation in certain areas. Now your father is obviously a very outspoken man and has said a lot of things that his opponents have attacked him for. I'm wondering if at any point when you hear your dad say something in his speech, do you ever stop and say - Dad why did you say that? Do you ever talk to him about that? You certainly disagree with your parents sometimes. We have healthy debates in the family. But my father is an amazing man. He is truly my best friend the world. He's a great person. He's been an amazing father and I can tell you, not only is he is brilliant and he's an incredible negotiator, he's doing this for the right reason. He doesn't need to be running for the commander in chief of the United States and I think as you've seen this is an incredibly difficult process. You're taking bullets every single day. The media is writing stories about you every single day. You are constantly on the road. It is the most arduous process you can possibly imagine. And my father has funded the vast majority of his campaign; he's put in so much of his own money. He's doing this because America has given him absolutely everything and it's being run down the tubes, by quite frankly, crooked and corrupt and incompetent politicians. We have an educational system in this country right now that's 30th in the world. We have veterans all over the place that are being treated so horribly and they're not getting the treatment they need. We have 22 vets that are committing suicide every single day. We have almost 20 trillion dollars of national debt. We have infrastructure problems in this country unlike what we've ever seen before. I can't walk through an airport in this country without seeing an acoustical tile ceiling that's falling down. You have median incomes, as I mentioned before, that haven't gone up in 15 years, meaning people are making the same money as they were 15 years ago. That's not right. We have more businesses that are closing in the United States then are opening. We need to be the land of prosperity again. We need to insure a better future for our children than we have right now and our politicians simply aren't doing that and that's why my father is running he's running to restore the respect that America deserves. We just gave $150 billion to Iran, a country who for all intents and purposes hates our guts. And then a day later an engine to one of our military ships and our Navy ships breaks down and they point guns at our soldiers. As Americans we deserve better, we deserve more respect. And my father will really sort out those problems and he'll bring back opportunity to this country and he'll really do a great job for this nation. Has he ever said anything that you've really disagreed with, that you just didn't like the way he said it? I can't imagine you haven't agreed with everything your parents have said and no one does. I think that for all the debates (we’ve had), at the same time I'm proud of my father. He's done an amazing job. He will be a great commander in chief. I really give him a lot of credit for going through this process because it's a very tough process and it's tough to be on the stump every single day, speaking in front of 15,000 to 20,000 people, three, four times a day, in some cases on the news every single night. Sometimes you get passionate and you may waver over that gray line a little bit. I think it was really nice (the other) day when he had enough hubris to come out and say - hey you know I've said some things that I probably regret and looking back in the heat of the moment and I think we're all humans - and he is but he's an amazing guy and he cares deeply about this country and he's going to do a great job for this country. 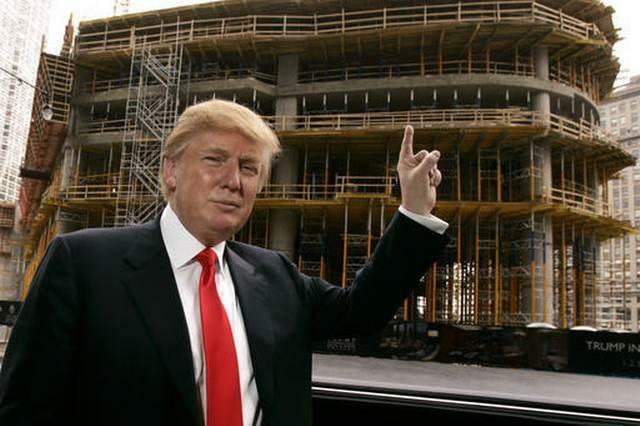 In this April 10, 2006, file photo, Donald Trump poses outside his Chicago offices and his 92-story residential tower underconstruction on the Chicago River. There's something about bulldozers and hard hats that brings a family together. It worked for Donald Trump and his father. And it worked for Donald Trump and his children. Your father is no stranger to the limelight. Over the decades we've seen him on television, in books, in social media, movies…so we've seen a lot of sides of your father. But you're talking to the voters now and besides what was said at the convention, what exactly don't we know about your father? Everything he's ever touched just turned to gold. He's built a real estate empire. And he did it employing American principles, which is: hard work and tenacity and going after the American dream and trying to achieve that. I've never met a person who works as hard as my father; he just doesn't stop. And he'll certainly do that for America when we win this thing in November. He's also an incredibly kind man and he's incredibly generous. He’s the type of guy who would give his shirt off his back for anybody who needed it and he's an incredibly loyal person. The first thing he said when he decided to run for president, he actually told us, ‘hey guys, let's do this, let's do this together.” (He also said) we're going to quickly learn who our true friends are and he's had a lot of friends that haven't been loyal to him and I think you've seen a lack of loyalty in a lot of cases. And that comes with the political process and we knew that was going to happen. But he's an immensely loyal person. If he loves you, if he cares about you, he's just a person who is immensely loyal but he's also a great all-American guy. There's no one who's knows more about sports than he does. He could give you any stat for any baseball player, for any football player, or for any golfer. He's a sports maniac and he's just a great all-American guy who wants to see this country thrive again. Anybody who gets into this process, you're in it to win it, and you're not getting this far without that attitude. Somebody has to lose, so let's say come November he loses. What does Donald Trump do then? I think he said it before. He’ll view it as a big waste if I wasn’t able to achieve all the things I want to give. I wasn't able to get the national deficit back in line and was able to take care of education. I wasn't able to fix our V.A. and rebuild our military into the strongest military in the world even far stronger than it is today; I wouldn't have been able to rebuild the infrastructure of this country and get jobs back into this country and stop the other countries from ripping us off. And I think he would be really disappointed. I think you want your commander in chief to be the ultimate competitor because that person has to represent the United States every single minute of the day. You want that person who is going to work 24 hours a day, seven days a week on behalf of all the great people of this nation and that's what he'll do and if we lose, what we do, we have an amazing family. We'll go back to doing what we do so well, building hotels. You obviously saw firsthand what we did in Doral, where we took a bankrupt property and we turned into something that's incredibly special. We'll go back to all of our employees and the properties we love and what we love to do. But he would really love to fix the problems of this nation and he would do a great job fixing the problems of this nation.